Dedication of Monuments on Bull Run Battle-Field. The dedicatory exercises were conducted on the first Bull Run field, by Rev. Dr. McMurdy, who read an appropriate service, which was followed by a hymn written for the occasion by Pierpont, a military parade by the 5th Pennsylvania Heavy Artillery, Colonel Gallup, and a salute by the 16th Massachusetts Battery, Captain Scott. At the close of these ceremonies, eloquent addresses were delivered by Judge Olin, General Wilcox, General Heintzelman, and General Farnsworth. 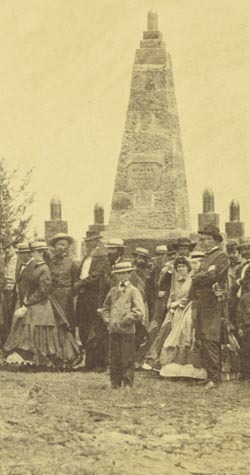 At the second Monument the services were similar to those described.